"I want to go on a Disney cruise." Yes, definitely an important piece of information to relay. That's the thing about Max's speech app: For six years now it has equalized the speech playing field for him, enabling him to share his thoughts whether they involve wishful thinking, requests, fantasies, questions, observations or just being a sibling tattletale (he has been known to type "Sabrina is bad! ")—you know, the usual gamut of thoughts kids have. 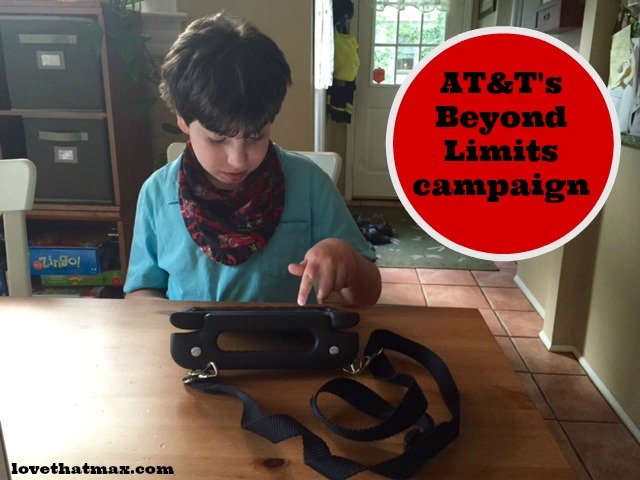 I've got gratitude for Max's iPad on the brain because of AT&T's new Beyond Limits campaign, the sponsor of this post. The social project celebrates the achievements of people with disabilities, and the technology that empowers them and lets them inspire others. There's a cool contest (more on that below) and featured videos about three-time Paralympic gold medalist Alana Nichols, former Rutgers University football star Eric LeGrand and extreme wheelchair Athlete Aaron "Wheelz" Fotheringham, who says one of my favorite lines ever: "You always think you can't do something...but you don't truly fail until you give up." From the very first time Max showed me he could use a speech app (here's the video), it has been a game-changer for him. I know, like many parents, we were at first concerned that if he used augmentative communication he might be more hesitant to articulate words, but we've found just the opposite to be true. These days he is a multi-faceted communicator, using typing, speaking, nodding, gestures, foot stomping (when mad): the whole shebang. Since mastering the iPad, Max has expanded to email and texting. Technology has helped him express himself beyond limits. And just like those athletes in the videos, it's helped pump him up—as you can see in this video. SUBMIT YOUR OWN VIDEO, WIN A GREAT TRIP! For more information on AT&T's commitment to supporting people of all physical and cognitive abilities and creating accessible technology, check this out. You can follow the campaign on social (and share your child's or your own Beyond Limits story) with #BeyondLimits. This post was sponsored by AT&T; all opinions are my own. Technology allows many cool things to happen. I'm dyslexic and dysgraphic. Typing gets around the glitch in my brain and fine motor skill difficulties. Digital documents can be adjusted using for example the Dyslexi font, changing the size, the color of the font or the background all make reading easier. Text to speech helps with unfamilar words that don't conform to English phonics. Speech to Text helps me spell words I know but have no idea how to spell. Way back in the 80's spell check taught me to spell basic sight words that I always struggled with. The red underline wasn't judging me - calling me lazy. I developed a system were I would attempt to spell the word 3 times before looking at the suggestions. Technology is going to level the playing field for many people. An beautiful video of an amazing boy and his amazing accomplishments! I hope Max wins the contest!